Omnia Environmental Consulting were commissioned on behalf of a volume house builder to undertake a ground investigation on a greenfield plot of land previously used for cattle pasture. The site was previously un-developed other than three small structures associated with agricultural equipment storage. With a review of the historic mapping and background environmental data suggesting no active pollutant linkages, the focus of the investigation was on the geotechnical properties of the site. 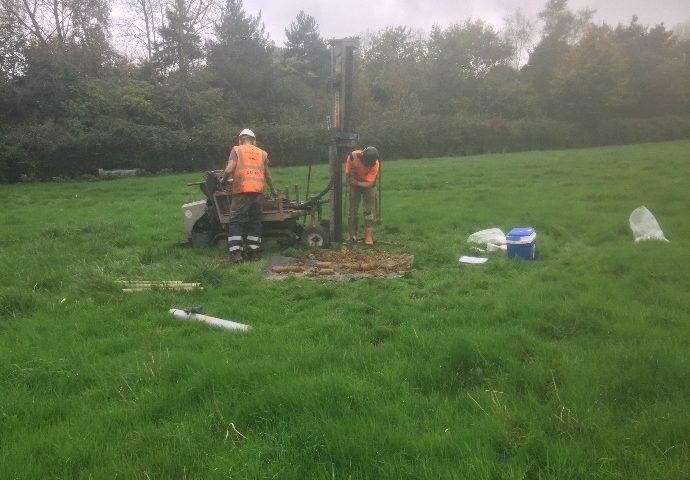 The site investigation included window sample boreholes to obtain samples and undertake SPT’s (Standard Penetration Tests), and hand dug pits to obtain samples from near surface soils. California Bearing Ratio (CBR) data was obtained through in-situ Dynamic Cone Penetrometer testing, and the sampling of soils for laboratory testing was also carried out. Finally, BRE DG365 compliant soakaways were constructed as requested by the client’s Drainage Engineer. As set out in BRE DG365, the soakaway cell comprised a trial pit infilled with approximately 1.00m of clean 20mm granular shingle with a 50mm observation well installed to the base of the pit to facilitate water measurements and the deployment of Solinst leveloggers to facilitate continuous water level monitoring. Three tests were undertaken in each location, unless otherwise specified by the client, and interpretive analysis was undertaken by OEC. 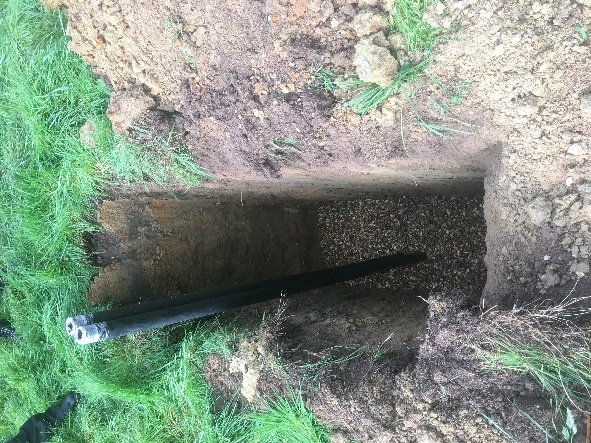 The results of soakaway testing reflected the highly variable infiltration rates across the site, with tests failing in some areas, and other areas of the site indicating poor to good drainage conditions. The construction, monitoring and interpretation of the BRE DG365 compliant cells allowed OEC to provide an accurate understanding of the drainage profile onsite, enabling the client to find the most site-specific and cost effective drainage solution.